Don’t blame me; I didn’t vote! I do blame you BECAUSE you didn’t vote. 2008… what do I have to do? My vote wouldn’t have mattered one bit, anyway. As I moved my blog to the new WordPress back-end, I remembered that I always wanted to append some comments (that I wrote on another blog) to this entry to better explain why I don’t vote. Taken out of context, they probably wouldn’t make much sense, so I’m copy/pasting in the whole discussion from this entry. And, yes. I think it’s quite funny how long this comment is in comparison to the original post. I couldn’t read it all. It’s too weird and scary. I’m almost finished with the second “Persoplis” book (great graphic novels, by the way. http://www.amazon.com/exec/obidos/search-handle-form/002-8182807-8156053) and too much of it is familiar. I feel like it diminishes the horrors of Germany and Iran to compare them to my cozy life, but these things always start with a subtle errosion of rights and a subtle tightening of a vice-grips of fear. We’re not off to a good start. BTW…Further investigation reveals that the blog may be fraudulent propoganda. Case in point: Creationism is NOT mandated in Science classes at ANY State level. Maybe some backwoods school district might offer creationism as a contrasting point to evolution. But I consider those districts “backwoods” because the ignorant population tries to make creationism a science. Creationism is a philosophy. Evolution is a science proven through observable/valid/reliable facts. Not that people came from monkeys…but the fact that gene frequencies change over time and those frequency changes affect our phenotype. Those districts are ludicrously filled with shallow minds if they actually think that religious philosophies can be a viable approach to the scientific process. Even the most conservative State would not be able to pass such an oxymoronic curriculum of ignorance as a component to Science. I don’t think the whole evolution vs. creation debate was ever, strictly speaking, a question of science vs. philosophy. It’s a matter of teaching different beliefs. I’m assuming that you believe evolution is the way the world works. Lucky for you, your belief has been adopted by the public school system in the United States. Come to think of it, that’s likely WHY you believe in evolution. Imagine, if you will, a universal school system that chooses to teach only a religion-based explanation for mankind’s existence (Creationism, let’s say.) Now, you still believe very strongly in evolution – wouldn’t you fight to have equal teaching time devoted to your side? I suspect that’s what Darwin’s supporters were up against 100 years ago. I get your point, though, Mike. We can’t expect our high school science teachers to present good lectures and invest time in creating curricula on Creationism – it’s philosophy (or theology, perhaps) and not their area of expertise. But what about grade school where one instructor teaches every subject in a classroom? Should not other theories at least be presented? If nothing else, I think that the students should know what other beliefs are out there. All that scary doomsaying had me thinking about my reaction to this election. I suppose my stance is pretty simple: America has spoken. 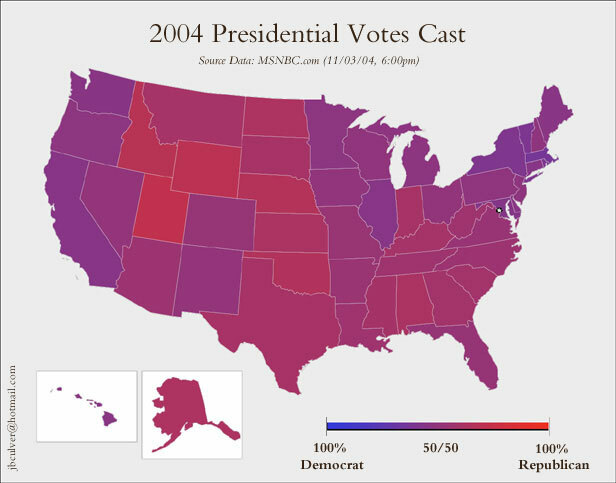 Looking at all those red states on the map, I was surprised that so many people voted for Bush, but whatever. But I work at a university and I just assumed that I’m out of touch with the world outside my social bubble. So, yeah. I thought about that. The majority of America, then, is different from me. I mentally cross-referenced that with my experiences in other countries and it checked out. It always seemed to me that people elsewhere have a strong stereotype associated with Americans, and I always thought that it didn’t do a good job of describing me (well, I hope not, anyway). Taken to the extreme, that could mean that I’m not a good fit for my country. Should I move? Expatriate? Renounce my citizenship in defiance of the Bush administration? In times like these, I can take comfort in the fact that I have a very easy option available to me – Russian citizenship is there for the taking (Wow. I’d love to go back in time to, say, 1985, and see my past self’s reaction to that statement!) I would love to obtain dual citizenship for both myself and Oksana, but I would never renounce my U.S. Citizenship for another country. I quite enjoy most of what America has to offer. What was my point again? Oh, yeah. Doomsayer Guy talks about how the religious right is going to take over our country. I may not subscribe to their beliefs and morals, but as long as they do it by the democratic processes we have established, I won’t complain. It’s the beauty of America – a majority of the people (as opposed to a single person!) CAN decide what kind of country we become. I trust that our democratic process and system of checks and balances will see us through. If not, I’ll meet you in Moscow. If a true-believing democrat can’t, in good conscience, live in our country after this election, should they expatriate? Of course, that’s up to them to decide for themselves, but the question got me thinking about the small number of blue states in the election graphics. I’ve always considered the U.S. as a single country, but in many ways, we’re more like a collection of small, cooperating nations. It’s right there in our name: We’re the _United_States_ of America! Russia’s like that now, broken up into multiple cooperative (and uncooperative, no doubt!) states. You can even draw comparisons to the European Union. It’s strange to me that, mentally, I don’t think of the U.S. in the same way. I wonder if citizens of other countries do. Perhaps this election is the beginning of a greater divergence between our states. I could visualize a world in which the West Coast becomes a haven for democrats – with states even going so far as to create laws (gay marriage anyone?) that are in complete opposition to other states’ laws. We already know that our government won’t stand for secession, but I wonder how different our states will be allowed to become. Perhaps far enough that crossing state lines will be, for all intents and purposes, expatriating. Just a note. I was on the front line and I saw what the republicans were doing. The “Poll watchers” were people in bright orange t-shits that said “HAVA”. They were standing behind the check in tables, noting the names, and noting the faces. They were high profile, and intimidating. Where were they??? In the black and Hispanic neighborhoods. Oh, HAVA… yeah, That stands for “Help America Vote Act.” The only thing is they were trying prevent people from voting. HAN(ot)VA. Police weree dispatched to eject some of them. The disparity between action and words is great. People listen to the words and ignore the action. Healthy forests that are cut down, Clean air that is polluted, etc, ad nausea. Politics in America is no longer issue based. It is ideologically based. The victory, however narrow, reflects a shift to ideological campaigns that cloak the truth in (thin) veils of “morality”, or “safety”. People do not ask questions. The republicans ran a successful campaign by putting issues on the ballot that would turn out the religious right. (gay marriage). The republican agenda is the antithesis of what America was founded on. They want to exclude people unless they agree. The democratic agenda promotes equality and acceptance. The republican agenda promotes inequality and division. Federalist 10 is a great argument in favor of diversity. One other thing to note. The stock market often reflects accurate predictions of the future. Look and see which stocks are the major gainers after the election… defense. Expect more war. As for your saying you trust the process of checks and balances to see us through, the whole reason it’s scary is because there ARE no checks and balances anymore. Law enforcment no longer has to observe laws that protect you (search, seizure, holding without being charged, surveillance without a warrant, etc. ), the Supreme Court will soon be all right-wing judges, and congress and the executive branch are already there. As for the lack of links in the original post, sorry about that. I didn’t want to link to the original because it was a huge page of comments at DailyKos, and I thought you’d all think I wanted you to read them all, which I didn’t. I meant to at least mention the blog it came from though. Here’s the link. Keep in mind DailyKos is a very liberal (though strictly Democratic – no 3rd parties) blog. That was a “diary entry” which is kind of like a guest blog – not a main-page entry, so it can get a little wacky (as Mike pointed out). However it WAS the first place I read anyone saying what I was thinking, about the rise of fundamentalism, so I used it. The idea is starting to crop up in other places too now. I wonder if Kerry had won, if there would be blogs talking about the coming of an authoritarian state or an anarchist state. If laws that protect families and marriages would be cast aside! Well, Bush was elected president; the world did not come to an end. I suspect that if Kerry had been elected it wouldn’t have either. The idea that ‘only’ Republicans would try to intimidate voters is asinine. If you want to vote, and you have the legal right to vote, some dork in an orange shirt isn’t going to stop you from voting. Ralph Nader was on the news complaining about how the Democratic Party had blocked him from being on the ballot in thirty or so states. So? If I really wanted to vote for him, I would use the line that says ‘write in’. Now I understand where you are all coming from, your point of view, your belief system is being challenged. You feel the people in charge do not reflect your values. And therefore the country as a whole will not reflect your values. I felt the same way at the prospect of Kerry getting elected. Some how in the last few years it has become ‘wrong’ if you are a religious person, somehow since I am religious my beliefs are wrong. Yet everyone else’s are right. I think everyone is entitled to their beliefs. I also think that in this the majority rules, and more people are religious than not. And they are tired of having their beliefs smeared by a mostly liberal media. So they spoke. And it was the first time in 16 years that a president won the electoral vote and the popular vote! And while %1 may not seem like much it equaled out to about 3.5 million people. While there may have been things going on behind the scenes (the orange shirts) I don’t believe the election was seriously tampered with. I don’t see how a handful of people could sway nearly 4 million voters. I like what Arlo said, America has spoken. But you know what? The great thing about our country is if you don’t like it you can change it. That’s part of our system, part of the checks and balances Arlo spoke of. The American Government isn’t some far away ‘them’ that we have no control over. There people, American people. They are elected by us, from us. It may not happen over night, but anyone who is willing to devote the time, can in fact change the system. Man I love this country, God Bless America. I don’t know exactly what you mean by “a mandate,” but 1% does a president elect. Putting aside the complexities of the Electoral College, voting is the system we all subscribe to as Americans. Now, when I said “America has spoken,” I was attempting to convey my own thoughts on the election. I was not trying to say that the overwhelming majority of Americans want George Bush in office. And yes, it’s clear that America is much divided over the issue of the presidency. That’s a good thing and is, more to the point, precisely why this “rise of fundamentalism” doesn’t bother me too greatly. The article you pointed to makes like it’s the end of the world (or at least the end of America), and that we’re spiraling downward toward the drain. The way I see it, we’re pretty damn near equilibrium. Perhaps I’m alone in this, but I wouldn’t want to live in a country dominated by EITHER side, right or left. The idea of fundamentalism is not “starting” to crop up. It’s been around for hundreds of years, since the original colonists came across the Atlantic. There is a huge, religious, moral-centric constituency in this country. I’m not at all surprised that Bush’s words resonated with them. Also, I want to clarify one thing. I said that I have faith in our government’s checks and balances AND the democratic process. That second part is key. If and when our government goes too far (either in trampling upon our rights, or abusing their power in other ways) we have mechanisms in place to make corrections. If you want an example, look no further than what happened recently here in Alaska. Many believed that Governor Murkowski abused his power by appointing his daughter to the senate. After Tuesday, governors no longer have that power. I believe it’s the same with the Bush administration. Now, perhaps you’re right. Maybe they will “abuse” their power and appoint a bunch of fundamentalist Supreme Court judges for life. But I don’t think that they won’t step TOO far out of line. 49% of the country is watching their every move and it will only take one small mistake to tip the balance of power back to the democrats. Bush can only be president for four more years, but I’ll bet that the Republican Party is so worried they’ll lose the office in 2008 that they’ll keep him on a very short leash. The eVoting thing? Yeah, they might have been tampered with. But I’m an equal opportunity cynic. Who’s to say that the Democrats didn’t alter the votes? Hmmm… you know what? Someone should do just that; hack into them and create such landslide results, either way, that the unreliability of the machines can not be questioned! The republicans were not advancing any laws that “protect” families or marriages. Let’s just be honest about that. They are trying to codify the biblical definition of family and marriage, and forcing everyone to comply with a Christian view of the world. This is not a Christian nation. The Republican Party is trying to make it one. A bunch dorks in orange shirts might not intimidate *you* but go to a low income neighborhood with black and Latino voters who are *very* intimidated by any government officials and they do. I was there and I saw it. The fact remains they were trying to prevent people from voting. Not only that, the strategy was to slow down the lines and increase the attrition rate. They challenged every voter in the college precinct on residency even though the residency requirement in Wisconsin are 10 days. Were the dorks in orange shirts stopping voters in the rich white suburbs…Nope! You are not wrong for being religious, you are wrong for forcing everyone to believe what you believe. If you are religious then you must have compassion. If you want people to accept your beliefs, then you have to accept other people’s. I don’t care what you believe as long you do not force others to believe it too. First time in 16 years? I must have heard wrong when Wolf Blitzer said that about the popular vote and the electoral college. Big deal/. As for me being wrong for ‘forcing my views on people’ aren’t you doing the same by taking away what it means to be religious? Is it only majority rules when it’s political? The Republicans and specifically President Bush ‘are’ trying to protect family values. What’s your definition of family? A crack whore and a lesbian? Is that any way for a kid to grow up and be a productive member of society? You feel the religious definition of marriage is wrong because it is in the bible, and for no other reason. Just because something is religious doesn’t make it wrong (and the same goes for the other way around). But it is a fact that if you have a kid and he comes from a broken home or some other non-family he is going to be screwed up. Period. So if you make your goal protecting families and strengthening them, guess what? You have just made this country a better place to live. Your so busy trying to not have my way of life infringe on you, you are forcing your way of life on me, how is that any better? Jeff, please answer this, because I don’t get it. If gay people are allowed to marry, how does that threaten the family? You realize it’s not like you would HAVE to divorce Becky and marry a guy, right? Jeff, I am not taking away what it means to be religious. I am saying thet just as you have the right to observe your values, so do two women or two men who love each other. No my definition of a family is not a crack whore. But possibly a lesbian. You don’t have to become gay if two men are allowed to maryr. I don’t understand why you feel so threatened. You can go on being who ever you want to be, but in order for that to happen you have let other people be who they are going to be. I did not say the bible is wrone. It might be roght for you. But it is not for me and it is not for many other people. How about Hindu, Muslim, Budhist, Aethiest, Jewish… each of those people can be good people and each of those people believe different ideas than you. Where did a broken home come into this? Are you implying that any non religious household is broken? I am trying to protect families. I am trying to make sure kids get lunch in school. That poor kids have a chance to go to college. That kids get proper health care. That adults have jobs to support all this. Just because you go to church on Sunday does not make anyone a good person. You have to live those values of tolerance and acceptance to make the world better. I am not forcing you to believe anything. In fact I am trying to protect your right to observe life in the way you feel is right. I am not telling you who you can love or what you should believe. What are you telling me? Oh boy…where to start and make it succinct. Hmm, I don’t think I can do it. 1)This is not the first time both the Legislative and Executive Branches were controled by the same party. As a matter of fact, it happens more often than not. When Franklin beat Dewey, the House gained a 93-seat Democrat majority and the Senate a 12-seat Dem majority. Having a majority in both branches is quite common. And things actually get done more efficiently this way. I remember how often Reagan would veto and pocket-veto bills that were drafted by Dems. 1) The question that will let you know a person’s party affiliation more accurately than any other question is: HOW OFTEN DO YOU ATTEND CHURCH? Marriage is an In-group/Out-group thing that holds certain sanctities in the Holy Bible. Now some people decide to pull that one phrase from the bible about a “man should not lie with another man” while ignoring other parts in the Bible like “disobedient children should be put to death.” As a matter of fact, more and more religious parents are “withholding the rod” and no longer resorting to physically disciplining their children. If this argument about marraige would have been happening 100 years ago, the fundamentalists would be pointing to the passage about how God segregated the peoples as support against inter-racial marraiges. Please don’t take this next part as heresy since it is my belief and why I think Christianity is so successful. Unlike Judeaism and Islam, the Bible and Christianity is allowed to be interpreted. Ironically, evolution part of the Bible because the paradigms in the Bible are allowed to be reinterpreted. The Bible was interpreted quite differently during the Spanish Inquisistion or The Crucible, and it is likely that it will be interpreted quite differently in future. The paradigm evolves to survive in society as well as guide society. I absolutely cannot believe that America is more theocratic now than in the past. If anything, America is more religiously diverse right now. 1) A Science class is meant to teach the discovering of truth through empirical data. Faith and philosophy take place outside the realm of objective observation. Hence, no philosophy should be offered in a Science class as a means of determining truth. At the beginning of a high school science course, students are taught about the different ways (philosophies and paradigms) of discovering truth before narrowing the field to Science. As a teacher, how would I give a grade in a Faith class. Irony…I would observe the students. 1)The #2 question for determining a person’s party affiliation is: HOW MUCH DISPOSABLE INCOME DO YOU AQUIRE IN A MONTH? I really hate (I know hate is a strong word and I am using it to effect)…I really hate the fact that there is a clear upper/lower class division of the Rep/Dem party. Since I am lowerMIDDLE class, it frustrates me to see the disparity in the system and how the Super-Rich are getting tax cuts and the Middle class are building debts. This is the first time I did not vote Republican. My reasons for it have to do with the class disparity, No Child Left Behind Act, and my own confusions about Iraq. 1)I agree mostly with Arlo’s reasoning but I am confused about his disposition. If you truly believe in the democratic process, why do you not want to vote and be a part of it. TO me it’s like saying you are truly a Christian but don’t seek fellowship at Church or something. I do believe that the democratic process works more times than not. I am also glead that we are so tempered (but not divided). One of the big problems with democracy is mob-rule (Red Scare, McCarthyism, ect.). Our tempering will prevent mob-rule. 1) I came from a broken home with homosexuality in my family and I don’t think I’m screwe…oh wait, never mind. Jeff, did you really mean to say “it is a fact that if you have a kid and he comes from a broken home or some other non-family he is going to be screwed up” or was that a typing glitch? If it is correct, are you also implying that kids with two parents in the home aren’t screwed up? Gotta hit the sack for my 7:15am departure tomorrow, but wanted to add a couple things real quick. Mike, I find your analogy in point #1) very interesting. In fact, I DO consider myself a Christian, and I don’t “seek fellowship at a church or something.” I was raised Episcopalian and take communion whenever I do attend. Going to church is not a prerequisite for belief, just as voting is not a prerequisite for faith in the democratic process. I take much comfort in knowing that if an issue will affect me directly, I can leverage my right to be heard… in chad form. Until then, I truly do TRUST the rest of America (you included, when you don’t cancel out your wife’s votes) to make, if not the _right_ decisions, ones that will not adversely affect me. Also, I would think that “The question that will let you know a person’s party affiliation more accurately than any other question…” would be “What party are you affiliated with?” You were wrong, therefore all your arguments are wrong. Jeff, I come from a broken home. Am I screwed up? Canceling out some of my wife’s vote IS a way of being heard. I am stalemating the opposing viewpoint. An interesting point about democracy in Brazil and Uraguay: All citizens between 18-70 are REQURIED to vote under penalty of imprisonment. Or (as I’m sure you already know) in Cuba where there has only been 1 name on the ballot since 1958 without a WRITE-IN spot. I respect your right not to vote, Arlo. I couldn’t imagine being forced to vote or living where it is required. And while I also consider myself a Christian who went to Cathacism, First Communion, and Confirmation, others believe you are not Christian until you are “born again”. It is a life-changing acceptance of faith that can easily be pinpointed in time. After being born again, that new Christian becomes a “real” Christian who seeks fellowship is is no longer living in the luke-warm. Thus, a born-again Christian would NOT view a person who has not been born-again as a Christian. While the broad definition of Christian means “a person who believes in Jesus Christ as the forgiver of sins,” many born again Christians even think that born-again Christians of other denominations aren’t even trye Christians because they are doing some part of their worship wrong. if you come from a broken home, you are going to be screwed up. Does that mean you are going to go out and shoot someone? No. But you are going to have problems. My parents divorced when I was 12, and while at the time I denied it, I have since realized that I have many issues stemming from it. If you come from a family that isn’t broken, you can still be screwed up. But the chances are more likely for you to make adulthood in one emotional/mental piece are better if you come from a home with two parents (a man and a woman) who love and cherish there kids. this isn’t about me, this is about our country. The future of our country depends on our children. Education is just one part of that. Putting families back together and encouraging them (with the tax cuts Pres. Bush so graciously hands out) and helping them work. I’ll say it again, just because something is in the bible doesn’t make it wrong. Jeff, you totally avoided the question! Okay, you don’t have to answer how gay marriage threatens YOUR family personally. Just answer how it threatens ANY family at all. Also, my critera for judging whether a concept is “right” or “wrong” has nothing to do with the Bible at all. I’m not sure why you keep saying that. My critera for this is simple: who is it hurting? This is why I’m asking you the question: who does this threaten? How does it threaten them? Look at it this way. It used to be law that a woman was the property of her husband after marriage, with very few rights of her own. People back then said “Marriage has ALWAYS been this way, and it shall ALWAYS BE!” This was determined by society to be wrong, and women now have rights when married. It used to be law that slaves couldn’t marry, including freed slaves. People back then said “Marriage has ALWAYS BEEN between FREE, WHITE people. It shall always be this way!” This was determined by society to be wrong, and it’s now legal. It used to be law that blacks and whites couldn’t get married. People said “Marriage has ALWAYS BEEN a sacred bond between two people of the SAME RACE! And it shall always be this way!” This was determined by society to be wrong, and now it’s legal. So I can’t help but look at this, and see the people screaming “Marriage has ALWAYS BEEN between a MAN and a WOMAN, and it shall ALWAYS BE this way!” and wonder, uh, maybe we should rethink this? The bible doesn’t enter into my logic at all. I simply want to know: who would gay marriage hurt, how is it actually threatening anyone, and isn’t it likely that this is an outdated concept just like the above laws were? I’ll echo Mass and add that the tax cut Bush so graciously handed out created a level of debt that our children will be forced to pay with money that could otherwise be used for social programs to help screwed up kids, and then for their education. I would like to hear an answer to Mass’s question and also ask why two men or two women inherently screw up their kids? And leave the bible out. Nobody is using except you, Jeff. While most of us are looking for empirical or even anecdotal evidence to answer Mike’s question, there are (politically) two ways to look at the question. My understanding of why most people arguing that gay marraiges hurt are arguing a moral point. They are arguing for something that is currently a taboo; to maintain a staus quo. Eating other dead people doesn’t “hurt” anybody physically (it might actually take a bite out of the whole world hunger problem if advanced institutionally), but we do not allow it because of a moral point. As a teacher, I have to agree that “non-traditional family” is a factor that is investigated students with poor behavior and academic skills. There are often other factors that may be more important which makes Jeff’s argument tricky because a screwed up kid is a qualitative (case by case) conclusion. You cannot lump all screwed up kids into the same pot because there are so many different factors on each child’s road to failure. And each one of those factors may be another kid’s cruch for doing so well. For example: It is not uncommon for a abused kid to do well in school. The child usually views school as the only place where “they have control.” These kids stay at school working, cleaning, taking to the teacher, ect. for as long as they can becuase they know that when they get home, hell begins. Yeah. I think we all intimidated ourselves. Or something. We wandered off topic, and it’s an important topic so I’ve avoided wandering further. But what the hecate. The gay marriage question is a little close to home right now. Everyone has been thinking and talking a lot lately about the function of marriage. As someone who holds very mixed feelings about marriage, who is about to get married I’ve been thinking a way lot about it. Anthropologically speaking, marriage exists to legitimize children. Many people still marry to have legitimate children. But to many, that’s not part of it at all. Infertile people are allowed to marry, as are people too old to have children. Marriage now means a lot more than babies. Money is a huge part of it, as are end-of-life choices. But the biggest things are love and companionship. How do you legislate that? I’ve read compelling arguments against marriage for anyone. It’s essentially a religious institution that the government sanctions. Ouch. That’s a can of worms that defiantly requires some changes. I’m not sure why the government needs to be involved in marriages at all. In the meantime, I do think these changing roles are good for all people. Rather than weaken the “institution” of marriage, all these changes (which aren’t complete yet) serve to strengthen it. I could have been like many people, and spent my whole life assuming that I would someday marry someone. I could be financially dependent on that assumption. I could let a “rock” on my finger determine my sense of self worth and femininity. I could let my goals and dreams for the future depend on it. If I had, then when I said “yes” last summer, I would have been doing little more than following a pattern that I’d always taken for granted. I’m sure I would still be excited and in love. But what really says something is that I’ve never taken marriage for granted. I question whether marriage still has anything worthwhile to offer. It will fulfill nothing about me, and prove nothing about my worth. And I still want to do it. That’s love. The fact that so many people who feel the same way about their beloved but aren’t allowed to publicly honor it detracts from that significance. If it were really about love, companionship, respect, all the things we want our marriage to be about, then it wouldn’t matter who married whom. Our love has nothing to offer that a gay couple’s doesn’t. So marriage must not be entirely about love. Some part of it is still about following a script and fitting a mold. And there’s nothing I resent more than pattern-following. I fear there are people who will see my marriage as inevitable, rather than chosen. And I fear that by legally marrying, I am betraying all those people whose love is not legally recognized. The fact that gay marriage is not recognized hurts my marriage.